After the idea of procuring an atomic clock failed to thrill the other members of Charly's household, our intrepid columnist simply decided to tap into the timekeeping of a GPS satellite. In doing so, he ensured the kind of punctuality at home that only large data centers actually need. Precisely. The network time protocol (NTP) is one of the easiest server-based services to configure. The ntp.conf file requires minimal configuration; just one line with a source from which to tell the time. You usually specify more than one source. 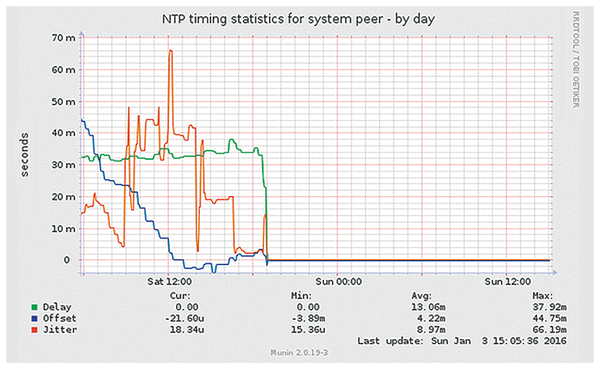 The NTP daemon (ntpd) queries it cyclically and tries to compute running time differences caused by network latency. My local NTP service runs on a Raspberry Pi (Rasp Pi), otherwise employed full-time in driving the garden irrigation system, and has a time imprecision of 30 to 40msec. This may be almost indecently accurate for my always slightly chaotic household, but logging with millisecond accuracy is a genuine requirement for data centers. How far can I take this newly inspired punctuality madness? First of all, I need to reduce the stratum. A highly accurate time source that makes its time signal available to the public is a stratum-0 device. A server that requests the time from it, and distributes the results, is a stratum-1 server, and so on. That's better; however, you can achieve even more precision, because transporting the data through the serial interface can still produce slight variations. You can compute these yourself: GPS satellites do not just transmit the time, but also a pulse per second (PPS) signal. These are short, high-precision pulses output every second. This was amazingly successful. My Munin graph in Figure 1, which shows the fluctuations of the time signal, flattens out to a smooth line after firing up the GPS-PPS combination – not bad for a stratum-1 time server. Figure 1: Diagram with the system time skew measured on Charly's Rasp Pi. If the day ever comes when I have accumulated enough hardware to require high-precision logging, now I'm prepared. Charly Kühnast manages Unix systems in the data center in the Lower Rhine region of Germany. His responsibilities include ensuring the security and availability of firewalls and the DMZ. Networks often require very accurate timekeeping. The Network Time Protocol provides the time with precision. On vacation we may be happy just to check the position of the sun,but computers need a more accurate measure of time. Luckily, there are atomic clocks that can receive time signals by radio and off the Internet. The Network Time Protocol keeps Charly up to date at all times. To put all of this punctuality in the service of the common good, he even exports the time signal. Despite the cyclical disruptions so typical of LUG meetings, our intrepid columnist, Charly, reveals how he set the system time in spite of a blocked NTP port. I’m late, I’m late, for a very important date. For many applications, it is important that your PC has the correct time and time zone. We’ll show you how to keep your PC clock ticking and how to use NTP to synchronize the time with a time server on the Web.